PRO PLATINUM PERFORMANCE equine balancer for high performance. PRO PLATINUM PERFORMANCE – for enhanced stamina, athleticism, muscle strength and development for high performance in all activities. Pro Platinum Performance is a superior equine forage balancer designed for horses in moderate to heavy work. Our high specification formulas are carefully balanced using optimum ratios defined by the National Research Council. Targeting only the deficient minerals in forage. It is a specifically formulated blend of minerals, vitamins and amino acids at optimum ratios to help balance the diet for both health and performance. It contains key B vitamins to support the hard working horse and aid a calm focused outlook and prevent stress, without affecting ability. 15g of MSM is included to help reduce muscle & joint soreness and aid recovery in horses subjected to hard training. MSM is an important component of connective tissue, playing a particularly important role in hooves, bones, joints & skin. Higher levels of Vitamin E as well as Vitamin C are added to help reduce oxidative stress. In addition it contains optimum levels of both Bio-Mos® & Yea sacc to support the gastrointestinal health of horses subjected to digestive stress from high performance activities. We recommend additional micronised linseed meal throughout the winter months or if a horse is fed predominantly hay/haylage , this is for the essential fatty acids that a horse may be short of when grass is restricted. Essential Fatty Acids cannot be manufactured within the body & must be present in the diet. Healthy skin & coat & improved coat pigment. Strong & healthy bones, tendons, ligaments and joints. Muscle & nerve strength & development. Faster recovery after hard training. Please note our guidance on the use of Salt: We do not add salt directly to our formulations. Chloride in salt is naturally quite abrasive. So adding salt can lead to rapid degradation of vitamins used in our mixes if exposed to light, moisture and heat etc. Addition of salt could considerably reduce the shelf life of our products. Our products are packed and sealed in carefully controlled packing facilities at our mixing house. We cannot guarantee how products are stored once opened by our customers. We have a fast turnover of products and all our mixes benefit from long shelf lives. Customers can feel confident that their products will remain fresh and free from degradation. Our Balancers and Premixes are formulated with the specialist guidance of World leading nutritionists at the Professional Mixing House Company we use. We recommend all horses should have free access to salt. However, a salt lick alone cannot be relied upon to cover maintenance & sweat requirements. Many horses do not choose to use the lick enough. The amount of salt needed is variable depending on how much the horse sweats. For example a 500 kg Horse needs 10g of sodium per day (25g of salt) for maintenance needs, this is without exercise or sweating on hot days. 1 – 2 tablespoons of salt per day, added to the horses feed is a reasonable amount to cover maintenance requirements. Working horses will require additional electrolytes. Dissolving the salt in water & spraying on to hay, can be an alternative option for picky eaters. Feed 2 x 75ml scoops per day for an average 500 Kg horse. 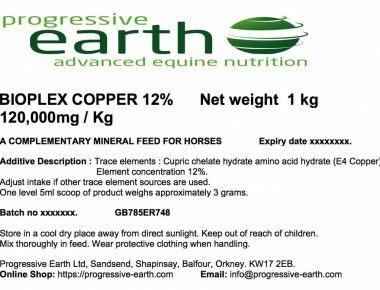 Feed 1 x 75ml scoop for an average 300 Kg pony. Do not exceed 2 scoops per day & adjust intakes if other trace element sources are used. When feeding for the first time, introduce gradually over a period of 5-7 days. Pro Platinum Performance is a powdered supplement which we recommend is mixed with dampened feed. How long will a bag last? 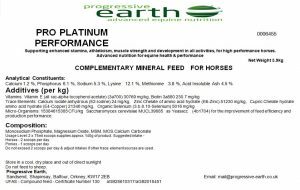 A 4.2 Kg bag of Pro Platinum Performance will last about 30 days when fed at the recommended rate for a horse at 2 x 75 ml scoops per day. The same bag will last about 60 days if fed at the recommended rate for a pony at 1 x 75 scoop per day. 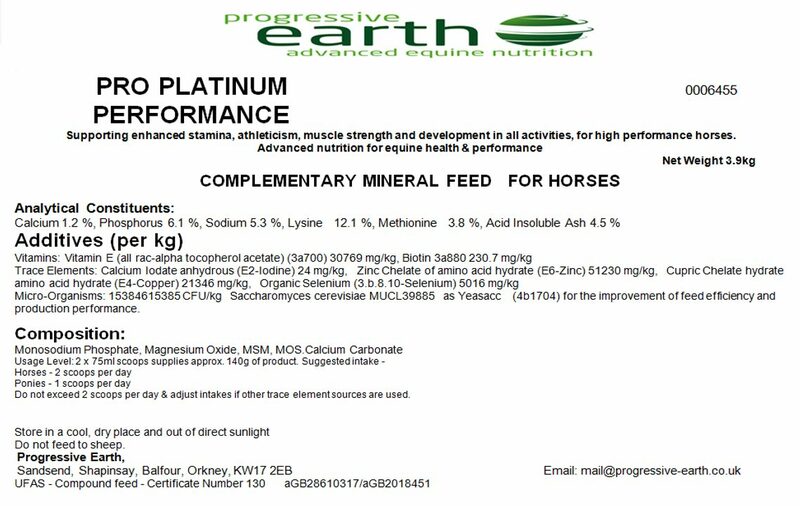 A complementary mineral feed for horses. Calcium-D-Pantothenate (3a841) 1785.7 mg/kg, Folic acid (3a316) 178.6 mg/kg, Vitamin C (3a312) 14285.7 mg/kg. Copper (Chelate hydrate, amino acid hydrate 3b406) 2378.6 mg/kg, Selenium (3.b.8.10-organic) 10.7 mg/kg. Micro-Organisms: 14285714285.7 CFU/kg Saccharomyces cerevisiae MUCL39885 as Yeasacc (4b1704) for the improvement of feed efficiency and production performance. Any questions? If there are any questions about Pro Platinum Performance or any other of our range of products please contact us by email. 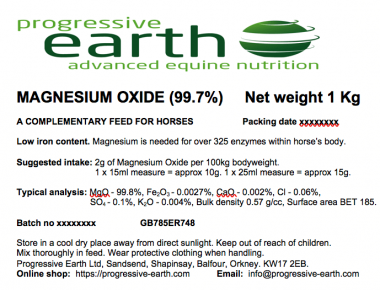 Pack size and availability: Progressive Earth Pro Platinum Performance equine feed supplement is available in resealable grip seal pouches containing 4.2 Kg of product. A 75 ml scoop is included. I’ve been using Progressive Earth products for a number of years, particularly the straight supplements, but in the last couple of months I’ve used Pro Platinum Performance. I chose Pro Platinum Performance with Mel’s advice as it covered all bases for my 3 horses. My little eventer needs help on the calming, digestion, suppleness/joint and hoof side, my dressage cob was struggling with digestion when they started living in, and my young warmblood just needs support for growing. Since being on Pro Platinum Performance Cody’s guts have been a lot better, Tex is super chilled and becoming more supple in his work, and Solo continues to grow at a rate of knots. All 3 are barefoot and I look forward to seeing how their feet look in a few more months on PPP. Wanted to share my experience with this product. I have a Bavarian Warmblood who lives at a wonderful barefoot yard that allows 24/7/365 turn out. I bred him and backed him about 18 months ago. To stay sane we do groundwork, hack, jump and even do some AE and XC – all barefoot, but my main focus is on dressage. He had been on PRO HOOF for 17 months with which I was very happy and his hooves have been great. Due to increased intensity of our training, I researched supplements again and decided to change to PRO PLATINUM PERFORMANCE about a month ago and I feel it has made the difference: Since then his stamina has improved, he has been shaping up nicely and his coat looks even more beautiful. 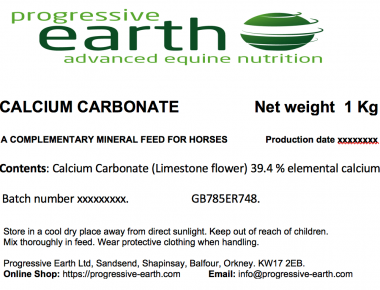 CALCIUM CARBONATE – Limestone flour for equine forage mineral balancing, healthy bones, teeth and fertility.